What do Worms do in the Rain? Ever since the heavy snowfall in January, the water meadow I pass most days has been more water than meadow. What I would like to know is, how do the worms cope? Can they really breathe and survive conditions that range from almost totally dry to what must be utterly soaked and saturated for days to weeks at a time? Kevin - Okay, worms are quite amazing creatures really. Unlike many other creatures, they obtain their oxygen through their moist skin. They don't have anything like lungs or gills unlike other animals. This means they can get the oxygen they need from the air which is the normal situation. But equally, they can get their oxygen from water because obviously water is H2O containing oxygen. 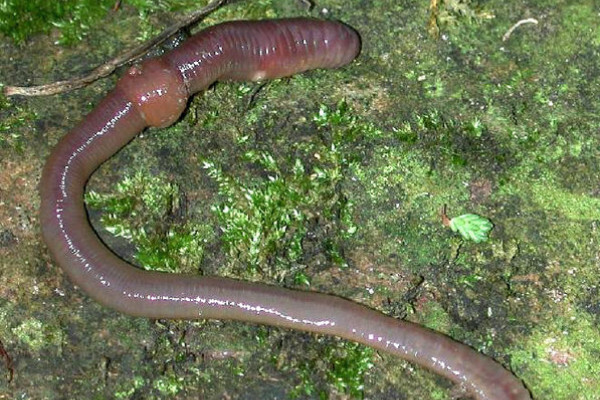 So if the earthworm is underwater, it can get oxygen just as easily as if it was in the air. And experiments have been undertaken keeping earthworms underwater for days on end, and they come to no harm. Some people think that if a worm is buried and gets flooded, then they would seek to escape. But as I just mentioned, they don't need to because they can get the oxygen they need from the water. However, quite often we see earthworms on the soil surface or on pavements seemingly trying to escape from inundation of water. But perhaps, it's not that. Maybe it's something slightly different - that the animals are actually trying to make use of the moist conditions in order to move away from their burrows, if you like, to pastures new so that they can mate with individuals that are not closely related to themselves. Not only can the earthworms survive well in the wet conditions, they can survive well under dry conditions in the soil, if it's really, really dry. And they do this, perhaps, by creating a spherical chamber in the ground, lining it with their own mucus, curling up almost tying themselves in a knot and just sitting there and waiting for better conditions to come along. And many species of earthworm do this. Others like the lobworm, the big worm that is in Britain, burrow deeply down into the soil and just avoid the dry conditions near the surface. Previous How Old is My Grandmother? Next How are fossils dated?